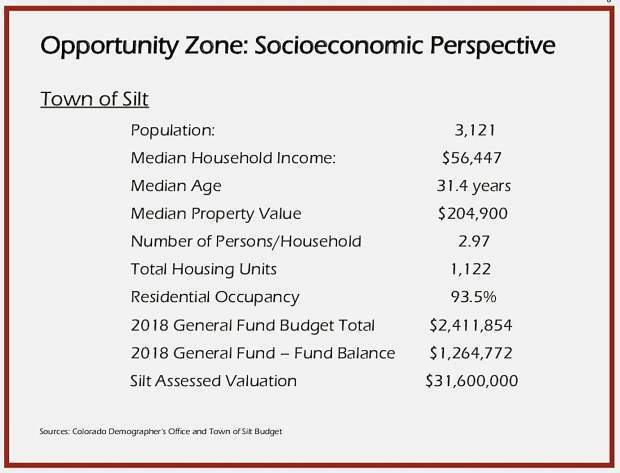 Designated as an Opportunity Zone in early 2018, the town of Silt is looking to attract new businesses to town as highlighted in a new investment prospectus released with the new year. Silt Town Administrator Jeff Layman believes the new distinction and investment strategy will make Silt more attractive to investors. He said the town will make a big push in 2019 to circulate the new prospectus to people, and businesses might be interested in Silt. Established by Congress in 2017, Opportunity Zones were enacted as part of the 2017 tax reform package to address uneven economic recovery that has left some communities across the country behind, according to the Colorado Office of Economic Development and International Trade. Silt, along with the Associated Governments of Northwestern Colorado and the state of Colorado, petitioned to have the town included in the federal government designation. The entire town, as well as a large area to the south of town, were included as an Opportunity Zone in early 2018. Layman said such areas were identified as those in the state that were left behind after the last major recession that began in 2008. The program gives investors incentive to invest in low-income and rural communities, like Silt, through favorable treatment like reinvestment of capital gains and forgiveness of tax on new capital gains. Silt’s Opportunity Zone Investment Prospectus hopes to advertise the opportunity zone to regional and national investors. It will identify and organize stakeholders to maximize investment potential. According to the prospectus, Silt intends to support projects that have affordable housing and sustainability as key components, and will identify properties and projects for capital investment, in cooperation with other entities and governments. In Colorado, opportunity zones are designed to promote parts of the state that have not shared in the general prosperity over the past few years, “upgrading the capability of existing, underutilized assets through capital improvement investments, funding the development of workforce and affordable housing in areas with escalating prices and inventory shortages and more,” according to the state economic development office. Silt and Glenwood Springs are the only Garfield County towns that appear to qualify as Opportunity Zones, according to the state office’s Opportunity Zone map.